Diagnosis of a pleural-based mass is a diagnostic dilemma both for the clinician and radiologist since it may represent lesion in the pleura, underlying lug parenchyma, localized pleural thickening, loculated collection of fluid or pus. In the present study, we compared the contribution of plain chest skiagram, ultrasound, computed tomography and ultrasound guided fine needle aspiration cytology in 20 patients with pleural-based mass. Each procedure had variable sensitivity in identifying the localization, nature, and extent of the lesion, Ultrasound guided fine needle aspiration cytology is a safe, complication free procedure if performed with proper precautions and provides cytological material in most cases. Thus, if a patient with a pleural based mass on chest skiagram, and has negative bronchoscopic findings, he should undergo a ultrasound examination to see if the lesion is solid or cystic. If it is solid, ultrasound guided fined needle aspiration cytology should be performed for a definite diagnosis. After the nature of the lesion is established, the patient should undergo a computed tomography scab for proper delineation of the mass, its extent, ad for the assessment of the mediastinum. Pulse Oxymetry as a monitoring tool to assess the severity and improvement during hospitalization and treatment respectively was evaluated on 20 hospitalized patients suffering from acute severe bronchial asthma. The mean value of SaO2 on admission was 87.36% (Â±3.1071) which improved significantly with treatment along with the clinical improvement and improvement in the PEFR Mean SaO2 on discharge was 98.2% (Â±0.834) as measured by pulse oxymetry well correlating with stable correlation of patient suggesting pulse oxymetry as a good monitoring tool for assessment of severity and monitoring of cases during therapy of acute bronchial asthma. A few reports have suggested the possible association between bronchogenic carcinoma and bullous lung disease. We report here a case who presented with massive haemoptysis and bullous lesions on chest x-ray. Fibre optic bronchoscopy showed o visual abnormality but bronchial washings and lavage from the bullous areas of lung revealed adenocarcinoma. 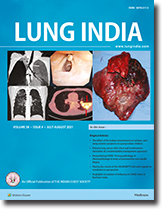 It is also emphasized that physicians should be aware of the potential development of lung cancer in patients with pulmonary bullae. We present a case of sclerosing mesenteritis, probably of tuberculosis etiology in a 45 years old male patient where the diagnosis was made on post-mortem examination. Sclerosing mesenteritis is a rare, idiopathic and benign mesenteric lesion characterized by fat necrosis, fibrosis and chronic inflammation seen in men in middle or late life. In some cases it may have an aggressive outcome. Though the etiological reasons have been varied, association of sclerosing mesenteritis with tuberculosis has not been reported previously.